I sometimes get the feeling that this is how other shippers want this manga to end. Synopsis: We begin already 27 hours into the school trip. It's snowing hard because apparently, we are somewhere in New Zealand and in the midst of the raging blizzard, Nagi has fallen face-first flat into the snow. She gets up and says that she'd never forgive "that girl." Now we go back a little bit earlier at 11:58 AM of 9/18. The school bus is apparently taking the Level 5 participants to the place of the contest. Hayate seems worried about where it might be, but Nagi doesn't care because she's certain that she'll win. She also says that she's more interested in what else is there to this contest because the rules are too simple. At that point, some numbers appear on everyone's completers and on a monitor inside the bus, Kananiwa appears to explain more about the contest. The top numbers represent the remaining time in the contest and the bottom numbers represent the number of participants, currently at 54. Furthermore, so that no one has an unfair advantage, everyone has to use the luggage prepared beforehand except for their clothes and any electronics will be confiscated until the end of the trip. Nagi is stunned because she wouldn't be able to play School Fes! Kananiwa adds that you can always have your stuff back if you press the button on the completer, Nagi is tempted to do it, but Hayate tells her not to. Also, the men in black will apparently be taking photos throughout the trip which can be purchased later. Everyone discusses the additional info a bit. Hina is determined to win as well. We now move to 21 hours later and the bus has arrived at its destination and it's freezing cold. Fortunately, one of the men in black informs them that there are warm clothes in the hotel. Hayate wonders where they could be and Nagi answers that it's New Zealand based on her awesome deductions coz she's a little genius! Hayate says that she's actually pretty smart (now you notice!?). The men in black inform them that the first day will be for skiing and that there's food in the restaurant too. A helpless Nagi calling out for Hayate... brings back memories. So after preparing off-panel, everyone is back on the slopes for some "skiing." Hina and Hayate show off their mad skillz on snowboards while Miki, Risa, Chiharu and Kayura sit this one out. 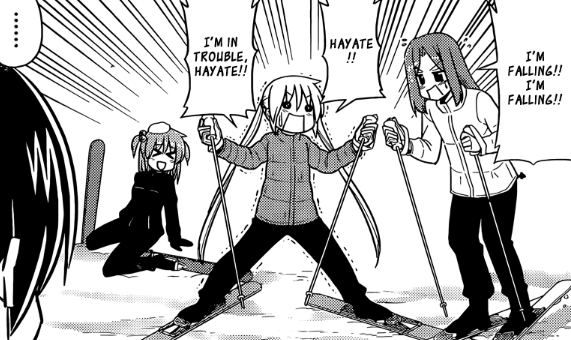 Meanwhile, Aika's about to fall over on her skis and so is Nagi who is desperately calling out for Hayate to help her... but he's too busy having a downhill race with Hina. Also, Izumi's already fallen over on her skis. Chiharu and Izumi mention that Katsura-sensei is missing, so she shows up at just that instant wearing a mask and declaring that she's not suspiciously after the 150 million. Observing everything so far is a girl who looks exactly like Ruri Tsugumi from CTMEOY appears - except that she looks a bit older and more sinister. She declares that there are a surprising number of enemies here. Meanwhile, Nagi and Aika are still hopeless on skis. 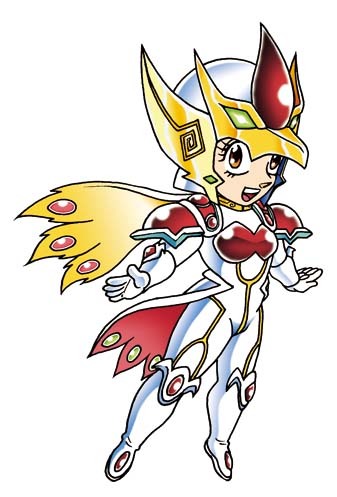 Review: Ok, so this is now officially the replacement story for CTMEOY, and we even have Ruri Tsugumi's initial appearance in the canon manga now... except that she hasn't been named yet, so we don't really know if this is Ruri or just a homage to her. Anyway, it looks like Nagi is too busy trying not to fall over for now, so we can set aside any speculations as to why she's taking this contest seriously aside. I wonder if she still knows Systema? 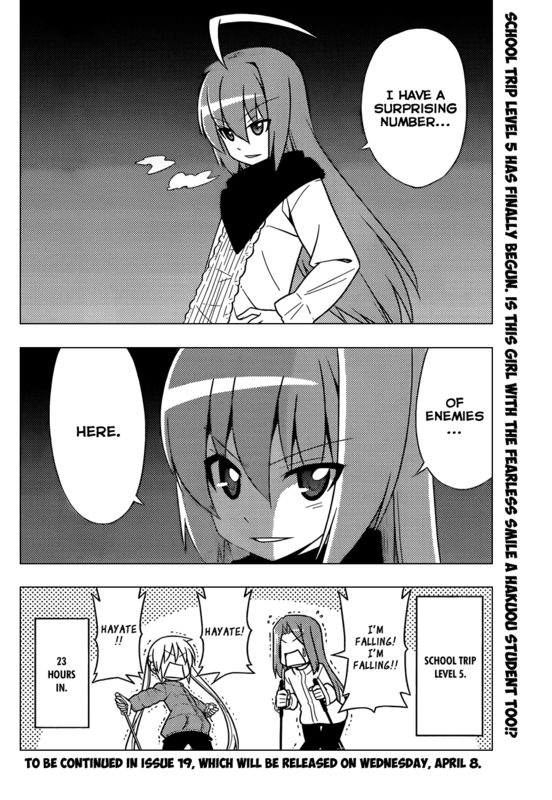 I liked how Hata reminded us just how smart Nagi can be in this chapter with how easily and matter-of-factly she deduced that they were in New Zealand that even Hayate (who normally thinks that she's a good-for-nothing) was impressed. Silly butler. I also liked the scenes wherein it's revealed that Aika is actually pretty hopeless in sports -- as she herself admits. Nagi being bad at skiing is nothing surprising. In fact, I'd be surprised if she was good at any physical task. With that said, I enjoyed her reactions here. Seeing her whining helplessly for Hayate to help her is a pretty classic meme for this manga, so that was pretty nostalgic. With that said, it looks like no one has really thought of pressing other people's buttons yet -- but we still can't say that it won't come down to that eventually. This is only the first day of the trip after all. Also, it seems that Nagi's been trapped in a blizzard somewhat, could it be not-Ruri-Tsugumi-for-now's doing? 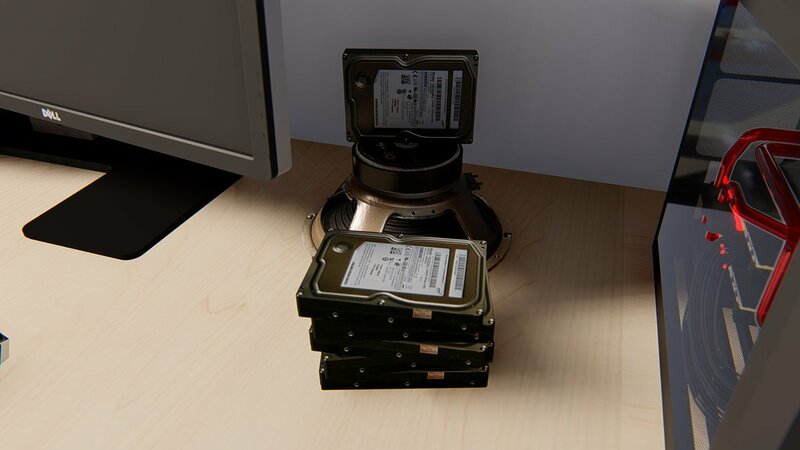 Well, I guess we'll find out eventually. Nagi and Hina both being determined to win looks like a girl vs girl setup. Of course, there's still Not-Ruri-Tsugumi-for-now and whatever Kananiwa's planning to complicate things. Over-all, this was a pretty enjoyable chapter if you've been following the manga thus far. Fanart Corner: This is just a preview, actually. I'm working on a step-by-step tutorial on how to draw Nagi, which I'll be posting this weekend. I'm making it specifically for people who can't draw or have very limited drawing experience. 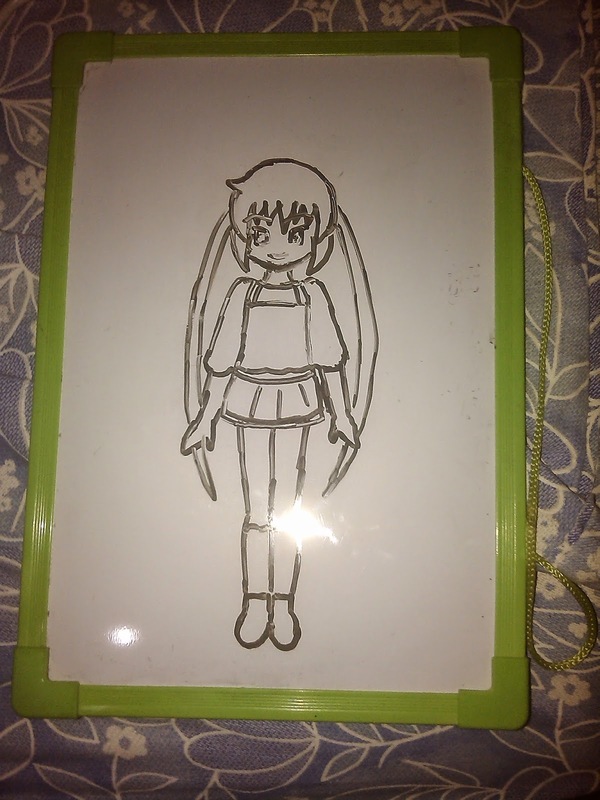 While I'm not an expert in any way, I'm a pretty competent hobbyist and I want other people to learn how to draw passable fanart with very little effort and if this inspires them to learn how to really draw, then that's all well and good... but even if this just shows them how to draw one specific character and do it well, then that's good enough for me as well. I'll be throwing in lots of dirty shortcuts that "real artists" would frown at, so be prepared to read the tutorial with this mindset. As a preview, this is what you can expect to be able to do if you follow the instructions. I drew this one in under 2 minutes, and anyone else should be able to do the same as well. Thus, I invite you to "draw with me" when I post the tutorial online in about 1-2 days. "Ok, so this is now officially the replacement story for CTMEOY, and we even have Ruri Tsugumi's initial appearance in the canon manga now... except that she hasn't been named yet, so we don't really know if this is Ruri or just a homage to her." I still have to write my review, but yeah, you are right. Hata-sensei may have the rights to the character designs of Dolly and Ruri, but may have to call them something else. Either way, I'm really interested in this story and hope Nagi's father is introduced in this arc. I remember Hata tweeting some time ago about how he'd like to draw Hayate and Nagi traveling around all over the world. This school trip could be the perfect chance/excuse to do it. Also, the implication seems to be that Ruri is somehow responsible for Nagi being stuck in that blizzard in the opening chapter... unless she was talking about someone else.